Low temperatures and persistent north winds made for a slow start to the bird banding season at PIBO. Mist nest were set up on the 16th and banding began the next day with 9 birds captured of 6 species, including White-Throated Sparrows, American Robins and Northern Cardinals. The most common birds captured have been Red-Winged Blackbirds, White-Throated Sparrows and American Robins. Warbler migration has begun to get underway, with sightings of Black-Throated Green, Western Palm, Pine, and Black-and-White Warblers, and a Northern Waterthrush banded on the 18th. April 27th in particular brought sightings of several warbler species that were new for the season: a Northern Parula, Nashville Warbler and Orange-Crowned Warbler were all observed along the West Shore Road in the afternoon. 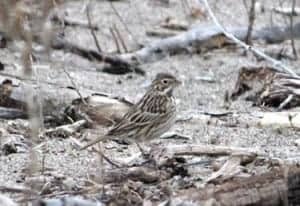 Many sparrow species have been hanging around the island, including several Vesper Sparrows seen along West Shore Road. A Cattle Egret was observed on the afternoon of the 18th hanging about on a cottage lawn at the North end of the island. This African species was first reported in North America in 1941 and has since become well-established in the United States and Canada. A breeding group of Cattle Egrets on Pelee Island was reported in 1975 by Loren S. Putnam of Ohio State University, who found approximately 20 nests in the marsh on the east side of Fish Point. The colony was abandoned by 1980 and since then they have been sighted on the island only rarely. In the breeding season they are easily distinguished from other egrets by the golden plumes on their head and breast. An interesting encounter occurred on the 25th, when the remains of a banded American Robin were found in the netting area. Upon investigation, it turned out that the robin was originally banded by PIBO in the spring of 2008 as a second-year bird, making it six years old when it was killed– a good age for a robin, although several years short of the current longevity record for the species, which is 13 years. It was probably predated by a Sharp-Shinned Hawk, several of which have been observed flying over the netting area and on census. The warm front that came through on April 30th brought in many new species, including Yellow Warbler, Blue-Headed Vireo, Grey Catbird, Baltimore Oriole and Rose-Breasted Grosbeak. A Virginia Rail was also observed on census. It was also our busiest day so far in the netting area, with 16 birds banded of 5 species, most of them Red-Winged Blackbirds. Perhaps owing to their habit of habitually perching on bulrushes and grass stems, Red-Winged Blackbirds have a strong grip and very sharp claws, which can make banding them a painful experience. These blackbirds were no exception, and Polysporin was in high demand at the Bird House that afternoon. All in all, new species have been turning up almost every day, and larger numbers of warblers are expected as the weather improves and more south winds come through.